Creativity: Thinking Inside the (Pizza) Box. Posted by Rachel Hamilton, author of The Case of the Exploding Loo and The Case of the Exploding Brains. People often ask how you can teach children to be more creative. I may have accidentally discovered the answer . . . ‘by being a slightly useless parent’. It all began with a craft project. Most of my parenting disasters do. Maybe there are families out there who enjoy making to-scale solar systems and erupting volcanoes. Maybe there are families out there who bond together over their papier-mâché space rockets in a craft-induced haze of glitter-covered glee. So when I discovered my son’s weekend homework was to ‘build a medieval castle’, I knew where I wanted to stick the castle turrets. To be fair to the history teacher, he’d picked a particularly bad weekend. My husband was away for work, the house needed cleaning (doesn’t it always – what’s wrong with these houses? ), I’d promised to appear at a local book event, I had looming deadlines for several magazine articles and I was judging entries for a school writing competition. I sent the teacher a polite note, inviting him to spend the weekend building a castle with my son. Turned out he was busy. So I rolled up my sleeves, found my son . . . and told him he was on his own with this one. While my much-nicer-than-me friends drove their kids to craft stores to top up their stash of castle-constructing-equipment, my son raided our garden for supplies and borrowed glue from our favourite neighbour (thanks, Claire). In a helpful moment, I pointed out the brief hadn’t specified how large the castle had to be, and suggested my son build a matchbox-castle. Dylan pointed out that he couldn’t build a matchbox-castle because we didn’t have a matchbox. In fact, we didn’t have any boxes. There was only one solution. Pizza! While I got on with my dusting, writing, judging, and pizza-eating, my son glued the gravel he’d stolen from the driveway into his still-warm Lucky’s Pizza box. “Uh oh,” he said, twenty minutes later. We gazed, sadly, at the not-quite-a-centimetre high walls, until a (metaphorical) lightbulb appeared above his head. “RUINS!” he said with a grin. “These are ruins. I have created ‘A Medieval Castle in Modern Times,” he declared grandly. 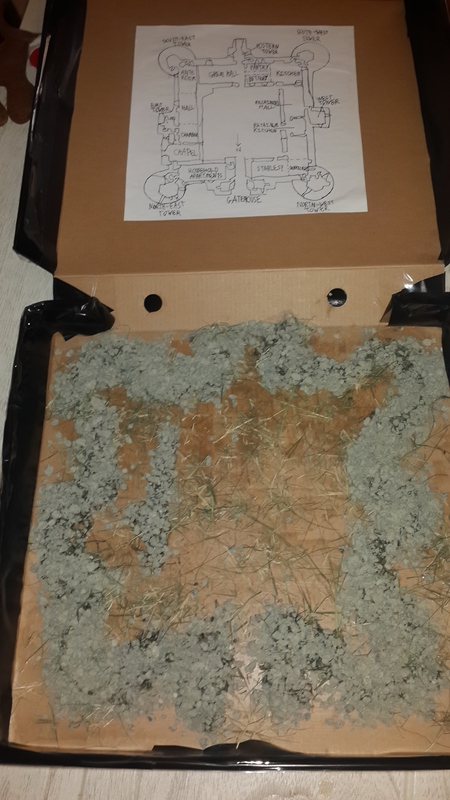 Photo: gravel in a pizza box. “Hmmm. . .” I said, trying to make ‘Hmmm’ sound positive. There was no point denying it. 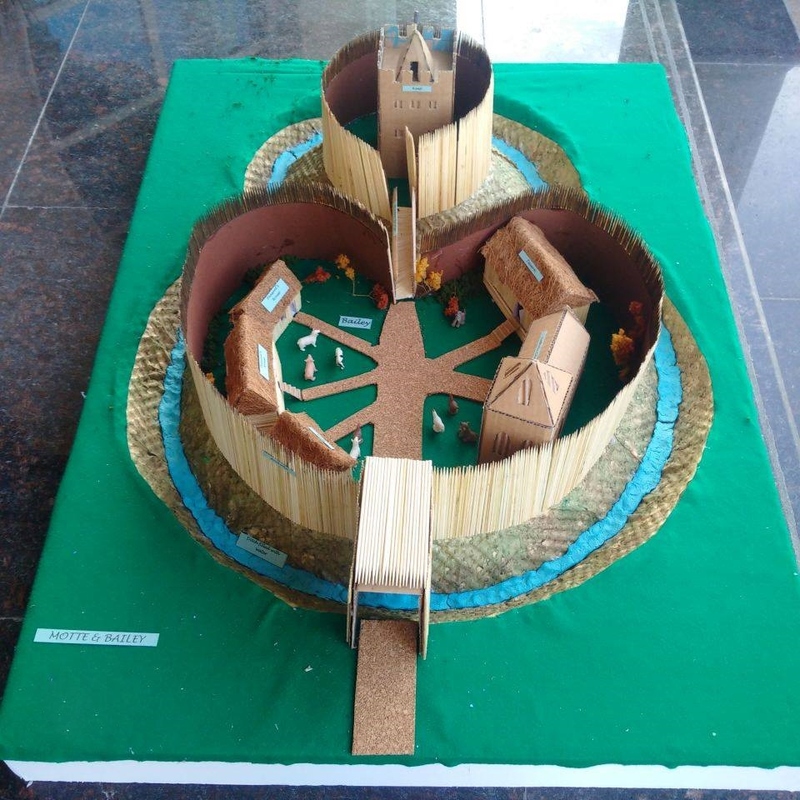 The kids at our school create pretty spectacular craft projects. Which is why we keep being given more of them to make – it’s a vicious craft-y circle from which there is no escape. 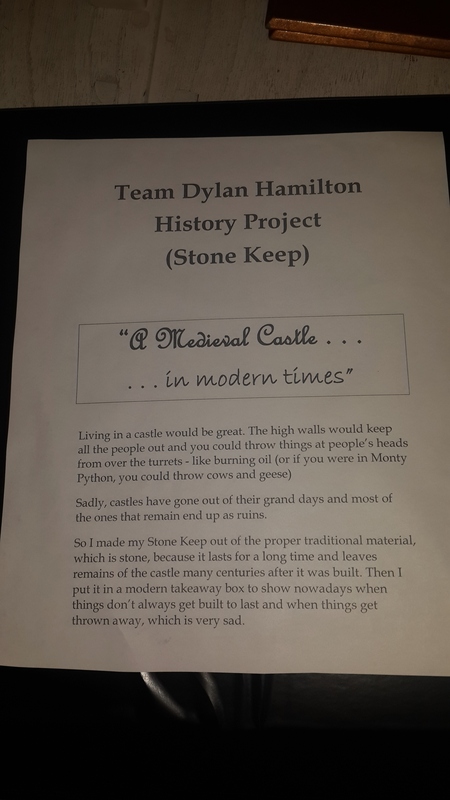 By now, Dylan’s classmates would have produced castles fit for an undersized Royal Family to live in. Photo: rather impressive castle not made by us. Looking slightly happier, Dylan turned on the computer and we both typed away merrily – me finishing my articles, him de-uglifying his castle with the power of words. I was even more impressed when he returned from school and told me his castle had won a prize. *Name changed to protect the innocent(ish) and to make my son’s school sound more like Professor Charles Xavier’s School for Gifted Youngsters. Tags: creativity, exploding brains, exploding loo, Rachel Hamilton. Bookmark the permalink. I think the ruined castle is genius! Ha, thanks Cavan. I feel a theme coming on with future craft projects. I just wish he’d thought of creating a pre-big bang solar system 🙂 That one was tough! You are a creative writer, and I think your son will be one too.